Over the past 20 years, the brown marmorated stink bug (BMSB) has become an increasing problem for soybean growers. An invasive species in the U.S., BMSB is a soybean pest native to Asian countries. This insect can be easily identified by its characteristic shield-like body shape. Usually a speckled dark color, the BMSB also has distinct white banding patterns on its antennae and body margins. Also considered a pest in its native countries, the BMSB damages U.S. soybean crops. BMSB feed by piercing through plant tissues and extracting the juices. This is particularly destructive to soybean seeds, leading to decreased size or seed abortion and ultimately a loss in yields. Depending on the climate, these stink bugs can reproduce multiple times a year. Adults overwinter in homes and buildings. Natural predators are scarce in the U.S., so soybean growers largely depend on insecticides to control infestations. Kelley Tilmon, an entomologist at The Ohio State University, works with the Ohio Soybean Council and soybean checkoff to develop easier BMSB scouting methods for soybean farmers. She’s analyzing the effectiveness of pheromone-coated sticky cards placed around soybean fields. Although these BMSB-specific cards were originally developed for orchard crops, Tilmon believes they will provide a quick and easy way for soybean growers to determine if they have a BMSB problem or not. If a significant number of these insects are trapped on the sticky cards, the grower should proceed with the more time-intensive net sweeping method to determine actual population levels for appropriate treatment application. Read the new Stink Bugs of Ohio Field Guide for more info. 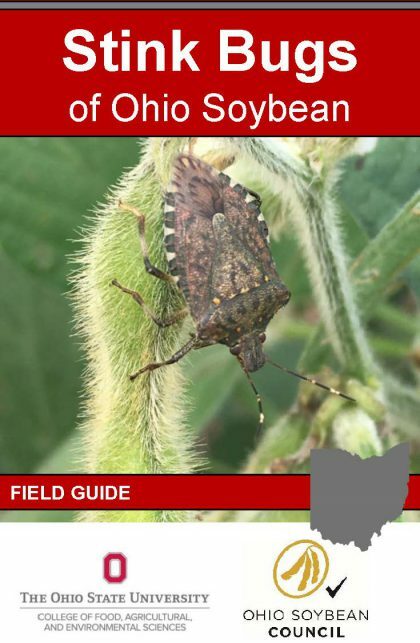 Check out the new Stink Bugs of Ohio Field Guide for identification and scouting tips from OSU and your soybean checkoff.